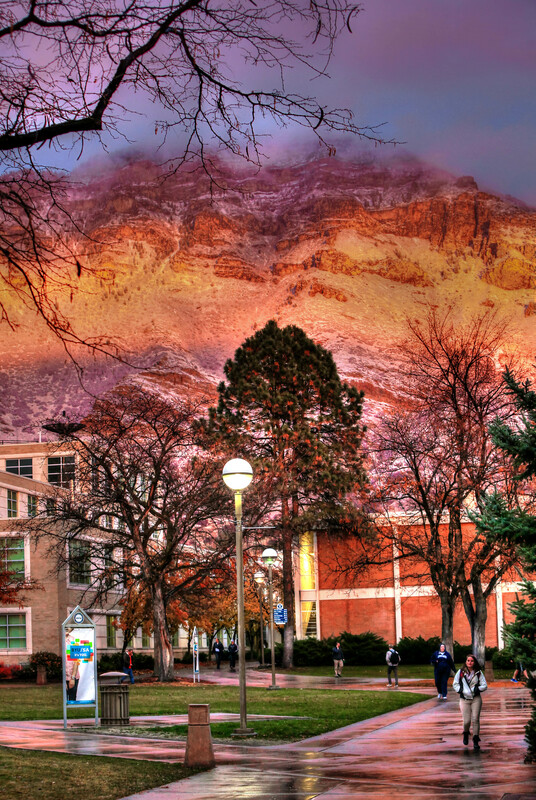 A few nights ago, we were just wrapping a shoot on the campus of Brigham Young University. It had been raining in the valley most of the afternoon and snow had been falling in the higher elevations. Just before the sun set, it dropped below the storm and lit up the mountain. I had just come out of one of the buildings to this scene. I wished I had a better vantage point, a better view. I find, often, that the challenge is not to find a better view, but to see the world where I am in interesting ways. The light changed, the sun dropped below the horizon, it’s brilliance faded. Yet, in that moment I marveled at the beauty. Fortunately I had the presence of mind to take a picture, for the light didn’t last. The storm was coming. It had been raining. Just before the sun set, it dropped below the clouds and lit up the mountain.